This doily is called Ocean Breeze and is 17 rounds and measures about 8 1/2". It's colorful and fun to make! The colors I used are- Aunt Lydias ecru and aqua, and Artiste salmon and carribbean. For this doily you switch colors 6 times. There are instructions for using 2 colors or just 1 available here- Ocean Breeze. For each round repeat from [ to ] until you reach the beginning of the round and make a slip stitch (sl st) where indicated. Complete! :) I hope that you enjoyed making this doily! This pattern is by Julia Hart of Draiguna. Feel free to link this pattern but please do not reprint it on your site. You can sell the items made from this pattern. Please credit me as the designer- Julia Hart of Draiguna, link to my etsy shop- www.draiguna.etsy.com, or to my blog- www.draiguna.com. Please do not claim this pattern as your own, sell, or distribute it. Thank you! This doily has 14 rounds and measures 7 1/2". There are lots of cluster stitches throughout the doily and also a few picots on round 11 and on the final round. This is the photo tutorial, written instructions are available here. The thread I used for this tutorial is Aunt Lydias size 10 thread in the color ecru. For each round repeat from [ to ] until you reach the beginning of the round, then make a slip stitch (sl st) where indicated. It's optional to block the doily if you'd like. I used water mixed with a little bit of starch and tacked it in place with stainless steel pins. 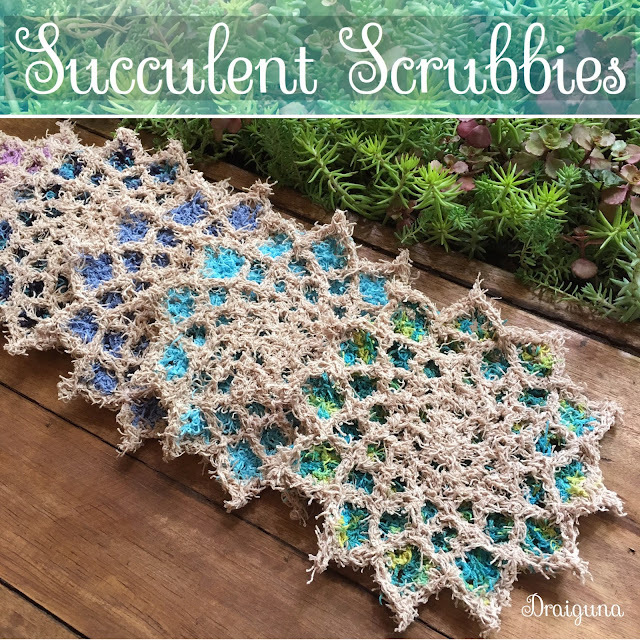 These washcloths are quick and fun to make! The back section is 4 rounds and the front is 6 rounds. They measure about 6". I used Red Heart scrubby cotton in the colors lavender, caribbean, tranquil print, calm print, and denim. The front color is tan. This is a photo tutorial on how to make them, written instructions are available here. Place the front over the back wrong sides together and right sides facing out. If you would like to add a loop for hanging, chain 12 (or until its the desired length) and sl st in the first sl st. Fasten off and weave in ends. This pattern is by Julia Hart of Draiguna. Feel free to link this pattern but please do not reprint it on your site. You can sell the items made from this pattern. Please credit me as the designer, Julia Hart of Draiguna, link to my etsy shop- www.draiguna.etsy.com, or to by blog- www.draiguna.com. Please do not claim this pattern as your own, sell, or distribute it. Thank you!